The good news is, of course, that all of the other 31 teams NEVER look for these qualities in a head coach, choosing only to hire old, stale, listless coaches, leaving us with a bevy of unemployed perfect candidates for the Packers. There are certainly plenty of names out there being tossed around, and for every pundit or blogger who finds a certain candidate promising, there’s another who finds the same candidate a poor fit. Luckily, they aren’t the ones having to get together in committee and make that decision. But one name in particular piques my interest: Jim Harbaugh, the bombastic coach at Michigan, and his name has been bandied about in some circles, first reported by Rob Demovsky himself. 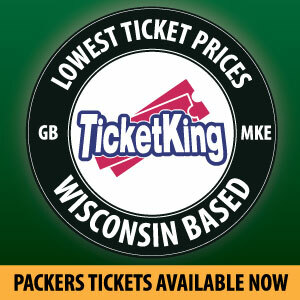 The reaction from Packer Nation is pretty consistent: no. But again, we aren’t the committee that selects the coach, and I have a sneaking suspicion if Mark Murphy can pry him away from The Big House, he will. If you are one of those folks crying out for someone to reach Aaron Rodgers and channel him to another MVP and Super Bowl, Harbaugh might be your guy. If you’re looking for someone that Rodgers is going to have to respect and may actually be able to hold a 2-time MVP accountable, Harbaugh might be your guy. You see, Vince was a Commander in leadership style. If you’re a Myers-Briggs kind of person, he was an ENTJ,–bold, imaginative, and strong-willed. He impressed not just his gameplans on his teams, he impressed HIMSELF on his team. Go check out the list of inspirational Lombardi quotes that his former players constantly repeat, gleefully. The Glory Years Packers would have run through a brick wall for their coach, and it if would help them win a game, he’d have ordered them to do it. The Lombardi-era players were notably devoid of egos, except of course for one: Lombardi. His presence was felt everywhere. He was loved beyond measure by his players. Borderline worshiped. When we think of the Glory Years, regardless of all the Hall of Fame players that came out of that decade, we loved the players, but we give all the credit to the coach. Holmgren? Sure. Remember the guy who called Reggie White and pretended to be God, telling him to sign with the Packers? And then Reggie DID? Remember the guy who channeled the pure unbridled energy of Brett Favre and turned him into a three-time MVP when by all rights he should have been Ryan Leaf after his first year in Atlanta? Remember the guy who coveted total control, a dual role of coach and general manager (like Lombardi), and left the team so he could have that ability to imprint himself completely on the team? Yes, Holmgren was also a Cult of Personality coach. Compare the tenures of the two most successful coaches in the modern era to that of Mike McCarthy, the other Super Bowl winner, who went 13 years before being forced out, not on his own terms. McCarthy is not a Cult of Personality coach. Not that it is a bad thing to not be a Cult of Personality coach. There are many assorted personality types out there among talented coaches, such as Tom Landry, the Logistician (ISTJ), Tony Dungy, the Advocate (INFJ), Bill Walsh, the Protagonist (ENFJ), and Joe Gibbs, the Consul (ESFJ). Heck, Mike McCarthy is likely a ESTJ, the Manager. None of things make you a bad coach, and in fact, all have had success in different way. But McCarthy loved his schemes and drills. He seemed to always be frustrated with distractions, annoyed with people questioning his decisions, and whenever things didn’t go well, he went back to the drawing board, usually drawing the same gameplan up each week anyway. This can work well enough to win a Super Bowl, which he did. But it wasn’t enough to tame a veteran, 3-time MVP quarterback who had entitlement issues. Oh, we like to say he reined in Favre, simply because of that successful 2007 season, but really, let’s take a look at that. Every season, he threatened to retire until begged to return. He continued to throw ill-fated passes when it counted most. 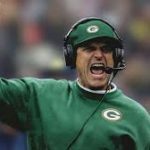 And, upon not being asked back quickly enough after retiring in 2008, it set up be biggest and most bitter divorce in Packer history, with McCarthy standing resolute as the guy who wasn’t going to put up with it anymore. Favre no longer fit into the gameplan. In the end, it worked out pretty well for the Packers, who won a Super Bowl with Aaron Rodgers a few years later. But it can’t be said that McCarthy reined in Favre. He tried to fit him into his scheme and tried to work with Favre’s own Cult of Personality. In the end, it couldn’t work. McCarthy was too much a technician. If Favre didn’t fit into his schemes, his personality certainly didn’t fit McCarthy’s logical and methodical approach to the game. So, now we look back at those Commanders, the ENTJs–Vince Lombardi, Mike Holmgren, Bill Bellichek–and Jim Harbaugh. You can’t deny that Harbaugh brings a common vision and does it with the sheer force of his own will. He’s brought success (however fleeting) to both the 49ers and the Michigan Wolverines. Granted, as soon as he left San Francisco, the 49ers faded. Was that the loss of his leadership, or Harbaugh sensing the end coming and jumping ship before he took that fall? And, who knows? Despite being a “highly successful football coach” at Michigan, he hasn’t beat Ohio State and the criticism is starting to mount. Seems like a good time for Harbaugh to leave while the getting is good, with his reputation still intact. Commanders don’t stick around until they get fired. A Manager, like McCarthy, just keeps plugging away at what they know, figuring that if it worked once, it will keep working. Then, they stare, blinking, surprised that they were just relieved of their duties. So, here’s the conundrum. What happens if we hire another McCarthy, on the assumption he’s going to be getting his ducks in a row and bring his innovative schemes to Green Bay? Is that going to rein in our newly-appointed legendary quarterback/MVP/future HOFer? That game manager-type sure didn’t rein in Favre. Why would we assume a similar personality type would rein in Rodgers? But the game manager, who would bring in a level of expectations and innovation, might be the guy for the long run, with or without Rodgers, just as McCarthy brought home a Lombardi Trophy without Favre. Yet, at the time, we were all worried about hiring a coach that could “work well with Favre”. Remember that? And in the end, he didn’t really work with him at all. He tolerated him until he could tolerate him no more, and moved on. And trust me, if you are Mark Murphy, you are in full panic-mode right now. Your scheme to take on total control has blown up in your face, and you are facing a locker room that has lost accountability–so much so, you just fired your Super Bowl-winning coach mid-season. Murphy wants that fixed now. And he also wants Rodgers reined in. I’m not saying its a smart idea. I’m not saying its the best choice. 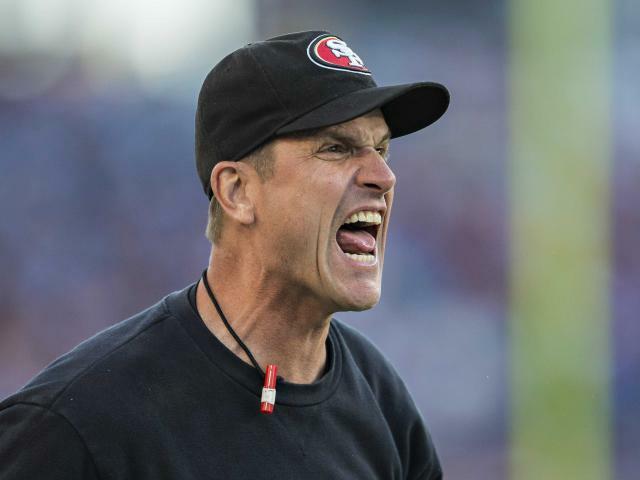 But you are hearing it here: Jim Harbaugh will be the next coach of the Green Bay Packers. This entry was posted in Authors, CD Angeli, Packers News and tagged Football, Green Bay Packers, Head Coach, Jim Harbaugh, Mike Holmgren, mike mccarthy, NFL, vince lombardi. Bookmark the permalink. Harbaugh is a fiery guy, and people like that, but nobody can live in a volcano.